One of the three admiralty cases between Spain and Odyssey Marine Exploration has been dismissed in Florida Middle District Court. Instead of a judge ruling, Spain voluntary dismissed its claim in the case. "… based on examination of evidence disclosed by plaintiff pursuant to Orders of the Court…"
In affect, Spain learned the shipwrecked vessel is not Spanish nor in their waters. Court documents indicate that the shipwreck is believed to be an Italian-registered passenger ship, which sank in 1915 during World War I. It is currently lying at a depth of 500 meters in international waters approximately 65 miles southeast of Sardinia in the Mediterranean Sea. 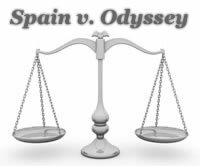 The legal dispute between Spain and Odyssey started back in May of 2007 when Odyssey discovered a 17th-century shipwreck, they code-named the “Black Swan”. Spain filed legal claims contending the discovered 17-ton treasure of silver and gold coins found at the site is a part of their country’s cultural heritage and should be returned. Odyssey said the treasure was found in international waters and was legally retrieved. “We are very pleased that Spain has acknowledged that its claim to this particular shipwreck is unfounded, and we are now looking forward to moving ahead in resolving all issues expeditiously with the other two cases,” said Greg Stemm, Odyssey’s Chief Executive Officer. “Technically, Spain’s dismissal of its claim in this case has no bearing on the other two arrests, but this shows that just because Spain files a claim against a particular wreck site does not mean it has a valid basis, or as in this case, any evidence whatsoever to support that claim,” commented Melinda MacConnel, General Counsel for Odyssey. The other two cases are continuing forward. The entire press release by Odyssey is embedded below.